Account & Billing option is grayed out? 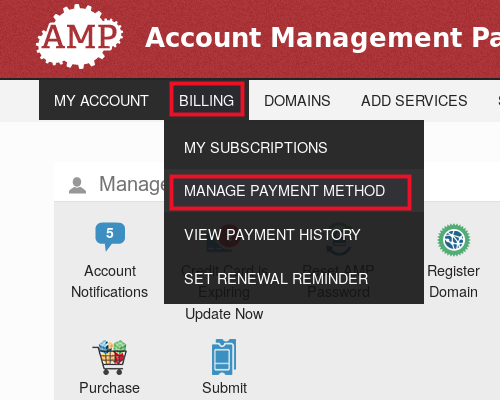 You can update your Billing and Contact information in your Account Management Panel (or AMP). For help logging into AMP, please read our article on logging into AMP. Roll your mouse over the Billing menu, and click the Manage Payment Method option. Changes made to your billing are updated instantly. You can modify your billing information at any time by accessing AMP. You can also learn How to Print a Billing Receipt/Invoice in AMP. Our billing system allows you to have up to 2 billing contacts to receive any billing alerts. The following instructions will help you update those billing contacts. In the main menu, move your mouse over My Account, and click the Contact Information link. You will then be on the Contact Information page. Click the Edit Contact Information button. 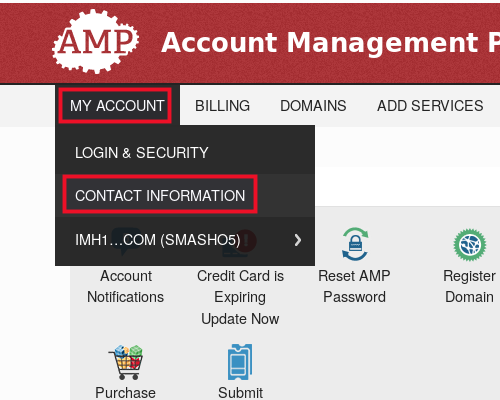 Enter your new contact information, click the Change Primary Email button to change your AMP login email. After updating your contact information, click the Save Changes button. You will then see a message stating "Your changes have been saved successfully." Congratulations, now you know how to change your Billing and Contact information from AMP! I want to make a credit card payment. You can also do this in AMP. If you're unable to do so following these steps, I recommend you contact our live support for additional assistance. We don't want to renew our hosting automatically. What can we do ? Please tell us. Our domain is smdleddisplay.com . You can change this information under the "My Subscriptions" section. Be sure to reach out to our Customer Service team if you have any trouble. They're available 24/7. When I tried editing my contact information to update my phone number, "Save Changes" kept getting grayed out without any indication as to why. To troubleshoot I tried adding a company name, and only then did a red marker appear under ZIP Code indicating it was a required field. Not really sure why it was initially blank in the first place, but hopefully this helps someone else out that encounters the same problem. A minor bug but please try to fix it so the red marker indicating that the ZIP code is required always comes out. Tried it on Chrome, Firefox, and Edge BTW, with the same results. Thank you for reporting this issue. In the meantime, if you encounter any other problems be sure to contact our live customer service team. They will be happy to help. How do I change the email address for server maintenance emails? That email cannot be updated through AMP. You can update your server contact information through WHM under "List Accounts" or (for more options) you can use the WHM Contact Manager. The company name should show up on invoices right above the account owners name. Although you cannot remove a card once entered, if you are selling the account and do not want the new owner to see your information, you can enter a fake card number, even all 0's. The changes I make to my account contact information do not save. After I make corrections and updates I select the save button it does not churn. None of the entries I make are saving. Nothng happens. How can I change the copany name, add phone numbers, and correct case errors? Thanks. Thank you for contacting us today. Sorry to hear about your issues with updating contact information in AMP. Since this is just our public forum I can't make changes from her. Please contact Live Support so they can update your Contact/Billing information. It also allows them to test your account and try to replicate the error. If you would like to provide information on the Browser, and Operating System you are using I can also investigate the problem further. I read through the comments on this chain. One comment suggested trying another browser because IE had problems. Bingo! I tried Chrome and was able to make the changes. In IE11 windows 7, I had tried several tims over the last couple of weeks with no success. So this issue seems to me to be IE11 related. After editing changes to my contact info & attempt to Save, it does nothing for me. It just sits there forever. I am having the exact same issue on IE10. Clicking on the Save buton after changing the contact details does nothing. The button is blue (not grayed out) but does nothing. I do not have the ability to install Chrome or Firefox etc. When will this be fixed?? Thank you for contacting us today. I tested this in IE11 and experienced the same problem as you. I have notified our development team of this issue, and they will be looking into it for us. Unfortunately, I cannot provide a time-frame, since it depends on the complexity of the problem. Sorry to hear you cannot install Chrome or Firefox. Are you able to install any other browsers, such as Safari? Alternately, Live Support would be happy to update your contact information. They are available 24/7 365 days a year. I'm having similar issues described above, but on Chrome. The 'Manage Payment Methods' screen allows me to fill in my information, but the 'Save' button remains greyed-out regardless of what I do. I opened Safari and went through the same process, and it worked just fine. I encounter this every once in a while on Chrome--there must be special setting that aren't always handled correctly. Thank you for that information. We will test that version of IE here as well to see if it is more than a local issue and if so, pass it on to our dev team. When I click on "Save Changes," nothing happens. The Changes are not accepted. We have just learned there may be an issue with IE11. Is that the browser and version you are using by chance? Question: Account & Billing option is grayed out? Richt. Well, here I am, blowing off the rest of the day trying to get into a Web site that worked so well before you had to go "improve" it. The "Account & Billing" option is grayed out. I have the feeling I'm talking to a robot . . . Sorry to hear you are having so much trouble updating your credit card. I checked your AMP account and it is functioning correctly. Under the Account & Billing option, click Details. Then, click the link for Update Billing and Contact Info, under Billing Options. We are real people (not robots), but this is a public forum. Remember you can always contact Live Technical Support for immediate assistance. Thank you for contacting us about your issue. When you say you are not able to get online, do you mean you cannot get online at all with that specific device? Are you not able to see sites such as Google? If you can see other sites, do you mean you are not able to get to your AMP? Or to your cPanel? If one of those is the issue, what error messages are you getting? Please be as specific as possible so we can assist you.